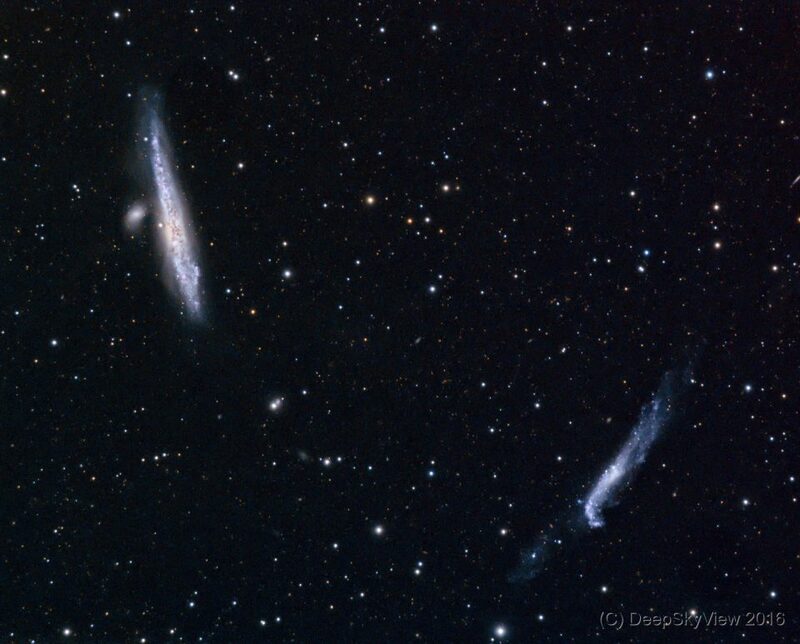 The Whale and Crowbar Galaxies, NGC4632 and NGC4656, in an LRGB composite. A pair of interesting galaxies in Canes Venatici, which might have had a close encounter in the past. The Whale Galaxy is an edge-on spiral galaxy with a slightly distorted silhouette, its about the same size as our Milky Way. The Crowbar or Hockey Stick Galaxy also shows an obvious distortion, which might be due to the interaction of the two galaxies in the past. After a very long break this is the first data taken with my equipment at the Sternenwelt Vogelsberg. Composed of 41 x 300sec of luminance and 12 x 120 sec (2×2 binning) for each RGB channel. Conditions where good, but transparency could have been better.